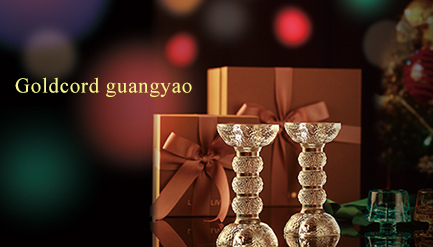 For the holiday season, LIULI LIVING debuts Golden Illumination, a brand new collection of candlestick holders. These visually arresting accents are ideal for parties, celebrations and get-togethers. Crafted from resplendent LIULI in relief sculpture, our candlesticks place Asian motifs upon Western candlestick holders. Illuminating the winter evening with a warm glow and warm blessings, Golden Illumination gives rise to an alluring atmosphere. The light of a flickering candle elicits an unparalleled ambience. A soft light, a gentle warmth, the allure of candlelight is both obscure and palpable. The Golden Illumination collection of candlestick holders tower high at 14 cm and when combined with the candlestick, makes a striking impact under any setting. From the sturdy base to the triple-layered chrysanthemum spheres, the design alludes to ascent and success. The advanced casting technique ensures that each petal is displayed in three-dimensional precision; the parting line is imperceptible for a flawless form. The Golden Illumination collection is offered in two styles: Golden Illumination and A blossom filled sky, Both feature flowers as the main motif. The chrysanthemum represents vitality, sincerity and true love. The plum blossom represents truth, fulfillment and elegance. Through the design, we offer a heartfelt blessing for the new year. The warm glow of candlelight has long since transcended its basic role of illumination. Light a candle to illuminate your world and conjure benevolence. May everyday with candlelight be a day worth celebrating.